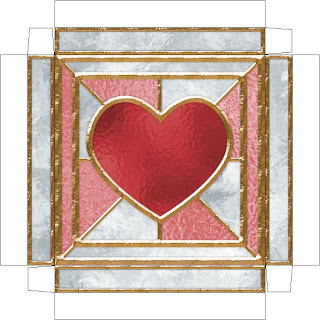 Another stained glass effect gift box. These boxes take 2 sheets of cardstock, scissors, glue or tape, a ruler and something to score the box to assemble. It's one of my favorite templates. The base is 3 inches, the lid is 4 inches. Make sure you print both the top and the bottom at the same dpi settings. If you print "fit to page" the lid winds up being too big for the box. 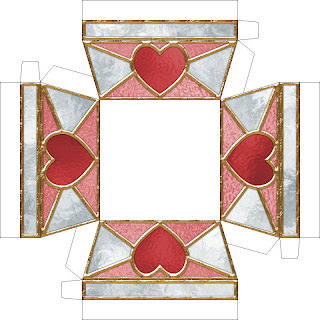 You can buy the blank template at my Etsy store for $1.60 if you'd like the blank to decorate. That is SO pretty! Really amazing looking. Thanks so much for sharing another gorgeous box, I'll be linking. 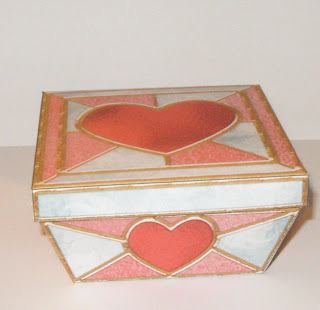 The Valentine stained box is lovely but when I printed the lid, it is 5 inches instead of 4 as stated in the blog. It's too big for the box. How do I make it 4 inches? I really like your stained boxes especially the moon and star design but that lid is also 5 inches. Help. The lid needs to be printed at the same DPI settings as the box, if it's printed at fit to page, the lid does wind up being too big for the box.